A group of students prepare to assist at a hospital in Haiti. From left are MaKenna Long, Brian Switzenberg, Aleksander Cook, Sabrina Zeiler and Ashley Baca. Sometimes students get more than they bargained for when participating in medical mission trips to other countries. 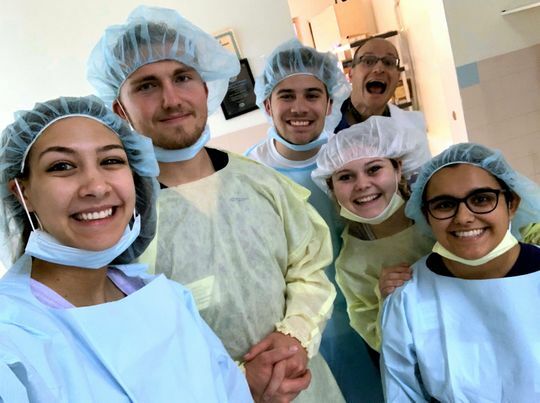 In fact, the experience may be so profound that they end up changing their major or become committed to making medical missions a part of their future. 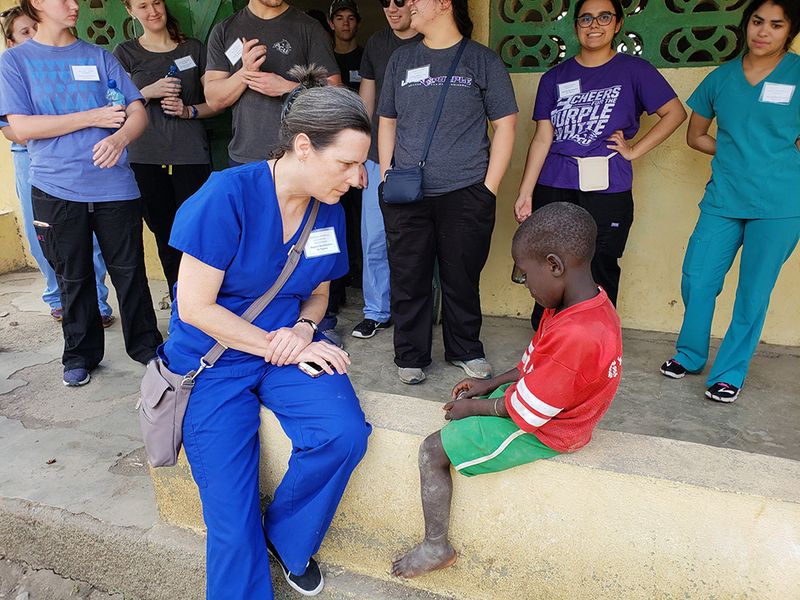 Dr. Cynthia Powell (’81), associate professor of chemistry and director of the Prehealth Professions Program at ACU, accompanied 10 students on a trip to Haiti in January. She saw again how important the experience is to students. “Seeing the opportunities and the great need can be life changing,” Powell said. The most recent trip was to work with Promise for Haiti over the Christmas break. Powell said students have been taking similar trips for several years during breaks at Christmas, in the spring, and in the summer. Powell normally accompanies students on one of the trips, while other faculty, staff, or alumni, go on the others. Dr. Cynthia Powell often accompanies students on medical missions trips to Haiti and Guatemala. Most recently, ACU has sponsored trips to Haiti and/or Guatemala. The nursing program also takes trips to both locations at different times, Powell said. In Haiti, the students work with either Promise for Haiti or LiveBeyond. In Guatemala, they work with Health Talents International and Adonai Ministries. Powell said the university is careful to choose ministries that are excellent models of partnership with local communities. She needn’t look any further than Sabrina Zeiler for confirmation that the students are, indeed, inspired. 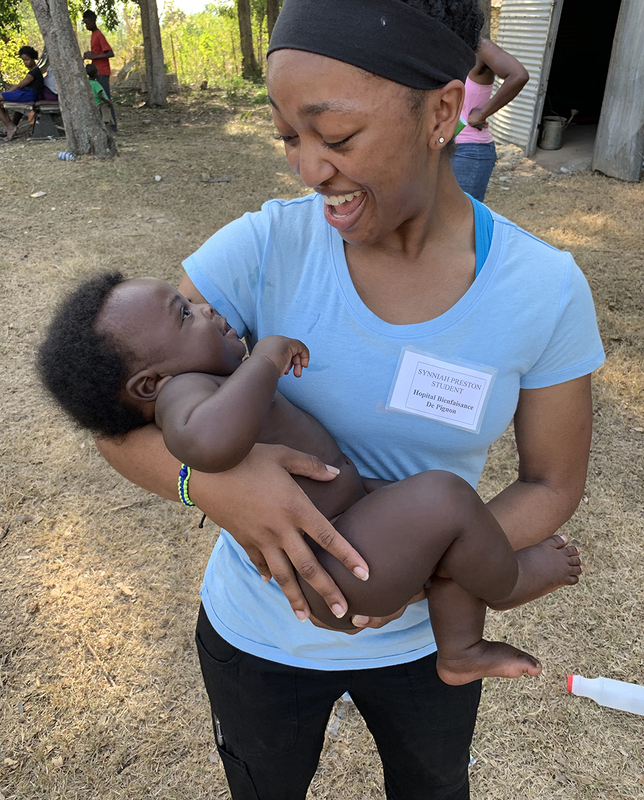 Zeiler, a senior nursing major from Carrollton, was fortunate to get to help in the operating room, with pediatrics, and with labor and delivery during the Haiti trip. Zeiler was happy to share the knowledge she has accumulated at ACU, but she was just as pleased with what she experienced – an awareness that the people being served had something to offer, too. 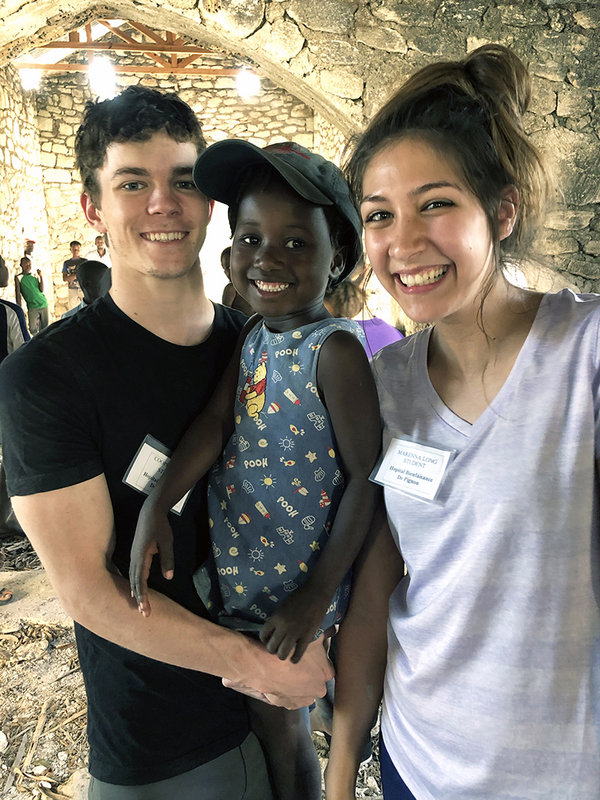 Cooper Bomar (left) and MaKenna Long pose with a friend they met through Promise for Haiti. “It was awesome to learn from them,” Zeiler said, instead of being the teacher. The students often find themselves doing the basic essentials such as restocking shelves, folding gauze, or entertaining children while parents are seen by a physician. If a visiting surgical team is one site, the students may get to shadow the team or help in patient recovery areas. Whether performing menial tasks or watching trained doctors in action, the students are learning, Powell noted. They learn about other cultures and about how medicine is practiced in other cultures. Before leaving the ACU campus, the students learn about the culture they will be working in. They learn the importance of respectful interactions and they learn about customs that might be different from what they know. And, of course, prayer is part of the experience. Synniah Preston is one of several students who worked with patients in Haiti. When the group returns, Powell said, they talk about what they learned, how they were changed, and what they wish to remember to help with their spiritual formation. Aleksander Cook is a sophomore biochemistry major from Flower Mound. He is in the pre-med track and no stranger to mission trips. Before the Haiti experience, he had been on three trips to India to work in an orphanage. He loves the opportunity to serve. Cook, inspired by his grandmother’s death due to cancer, plans a career in surgical oncology. But, thanks to trips like the one working with Promise for Haiti, Cook will take his love of missions with him, wherever he practices. “I would love to make that a priority,” he said.